The Food Standards Agency operates a national food hygiene rating system, popularly known as 'Scores on the Doors' under which all retail food outlets are tested for cleanliness by local authority environmental health staff. The outlets are then given a rating, based on the findings. These are usually available for public scrutiny on the authority and council's websites. Newham is gradually moving over to this system and its results will be available 'live' in a month or so. We have, however, been given early access to the ratings for fast food shops and restaurants along Woodgrange Road, and a pretty mixed bunch of findings are revealed. • how effective record keeping is, to ensure food hygiene. Regardless of the number of stars awarded, if the inspectors have major concerns over any of the three areas examined, they can determine that the premises was "non-compliant" with their overall expectations, at the time of the inspection. Inspectors take the owners/managers of the premises through their findings and point to ways in which they can improve hygiene levels, up to the 5 star level, after each visit. Inspections are conducted regularly, and are unannounced. There is a high turnover of food premises ownership and control, and the Environmental Health officials struggle to keep up with the changes in control/ownership and management. They hope to have all their findings, not just for restaurants, but for all other retail food premises in the borough available for public inspection on both the Newham Council and FSA websites by the end of the year. The Forest Tavern, which has had such a dramatic impact - for the better - on the local pub scene since it opened recently will be adding to the culinary offer locally, by opening its restaurant on 7 November. Secondly, The Observer's food critic, Jay Rayner made a valiant stab at promoting the recent Box Chicken trial on Woodgrange Road, in his article in the paper's magazine on 27 October. 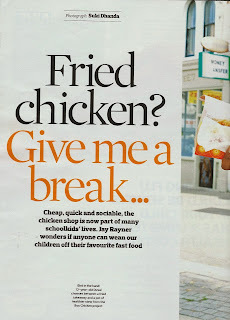 • The fried chicken market, nationally, is worth between £15bn - £20bn p.a. • There are 70 fried chicken shops in Newham. No secondary school is more than 500 metres from one. • The Box Chicken van was an initiative aimed at prompting healthier eating, by selling less fatty, more wholesome and flavoursome foods than the local chicken shop options, promoted by a not for profit organisation We Are What We Do. 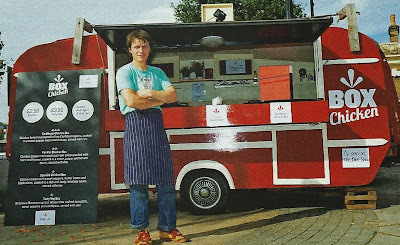 • On the van's best day, in week 2 of the experiment, it sold 29 portions of food. The previous day just eight. The recently opened, and adjacent, Dixy Chicken shifts 600 pieces of fried chicken a day. • The most enthusiasm expressed for the Box Chicken initiative on Rayner's two visits came from students from St Angela's, who were clearly encouraged by the school staff to act as cheer leaders for the experiment during his tours. 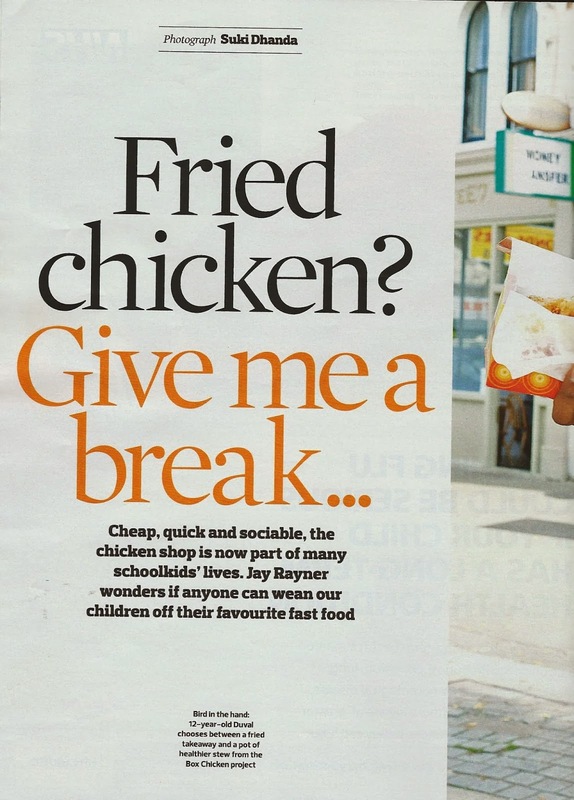 • Most depressingly: "We've seen all these chicken deals for 99p, why would kids spend £2.50 on the alternative." In the first of two parts, this week we look at the primary sector - both local authority maintained and independent schools for primary-aged children. The points raised below are not meant to be a definitive account of life at the school, for which people will look in more detail on the websites indicated, and elsewhere; but simply to be a lay person's answer to the "Wonder what that place is like?" question crossing the minds of passers'-by. As with all articles on this website, please feel free to comment in the section at the end of the article. Only unlawful, inflammatory or totally irrelevant spam comments will be excluded! The school was built in the early 1950s and is about to embark on a major rebuilding and expansion project. It is an inclusive school, admitting children of a wide range of abilities, including those with learning difficulties. ﻿The school received a "Good" judgement from Ofsted in its last full inspection, in November 2008, when there were 336 pupils on the roll. This assessment was confirmed in March last year, meaning that the school will not be facing another full inspection for some time. In 2008 the inspectors found the personal development and well-being of pupils to be excellent and the following characteristics to be good: overall effectiveness, early years teaching, achievement and standards, quality of teaching and curriculum, care guidance and support and leadership and management. There were 880 pupils on the roll (almost four times larger than the average size for a similar school) at the time of the last Ofsted Inspection, 2006, when the school received an "outstanding" judgement from the inspectors. An interim inspection in 2010 confirmed that judgement. ﻿The number of pupils who have free school meals is above the national average, as is the proportion of pupils with special educational needs. The school provides a variety of after school classes and clubs and offers free one to one tutoring after school or on Saturday mornings for any child that needs it. The junior school caters for children aged 7 - 11 and had 353 pupils on its roll at the time of its last full Ofsted inspection. The inspectors, then, judged the school to be "Good", with the inspectors commending its inclusive ethos. The "Good" judgement was confirmed in an interim assessment by Ofsted in March 2002. ﻿The Department for Education's Key Stage 2 performance tables showed that 86% of Godwin pupils achieved level 4 or above in both English and Mathematics, compared with the Newham-wide average of 80% and a national average of 79%. The infants school, catering for pupils aged 3 - 7, had a roll of 303 at the time of its last full Ofsted assessment (2005), when the school was judged to be "Good". Inspectors pointed out that the "Pupils achieve well because the school's leadership has developed positive, professional practice that ensures teaching is good." This judgement was confirmed in an interim assessment in March 2012. There are 956 pupils on the roll of this large 3 - 11 local primary school. Sandringham was last inspected by Ofsted in July 2013, when the inspectors' judgement was that the school was at least "Good" on all the measures assessed and "Outstanding" when it came to the behaviour and safety of its pupils, which the inspectors concluded "makes a very strong contribution to the climate of calm and purposeful learning ... pupils are well-mannered, friendly and courteous at all times"
William Davies had a school roll of 257, 3-11 year olds at the time of its last Ofsted inspection, in 2012, when the school was judged to be "Good". Ofsted concluded that "William Davies is a good school, which has excellent links with parents and carers and promotes spiritual, moral, social and cultural development. By the end of year 6, pupils' overall attainment is above the national average." ﻿The school's website isn't great, so there are few details about it here! Woodgrange an infants school, catering for 330 pupils in the 3 - 7 age range at the time of the last Ofsted Inspection, in 2011. The school was assessed as "Good" by the inspectors. It has a lower than average proportion of children with special educational needs and a percentage of pupils eligible for free school meals in line with the national average. Inspectors commented favourably on a comment by a parent/carer that "The school has a big part in the local community; its friendly, caring and welcoming and I'm very happy my child attends this school." This larger than average, mixed gender, Catholic primary school caters for 420 3-11 year olds. It was awarded a "Good" judgement in its latest, 2013, Ofsted inspection; an improvement on the "Satisfactory" it received, when previously inspected in 2009. The children start the school with lower than average skills and knowledge, but leave with average skills and knowledge for their ages, which represents good progress within the school. Children with disabilities and English as a second language make good progress because their specific needs are well catered for. The highest quality of teaching in the school is with the older age groups. The school is good in terms of: achievement of pupils, quality of teaching, safety of pupils and leadership and management. There are 391 pupils in this larger than average mixed junior school, catering for 7-11 year olds. The school was awarded a "Good" judgement by its latest (2013) Oftsed inspection, an improvement on the "Satisfactory" judgement it received previously - in 2010. 98% of the pupils are from minority ethnic backgrounds, with the largest groups coming from Bangladeshi, African "other white" and "other black" communities. English is a second language for 80% of the school's pupils. The school has a much higher eligibility for free school meals than the national average; so free meals are provided to all the school's pupils. The schools was assessed as having good: achievement of pupils, quality of teaching, behaviour and safety of pupils, leadership and management. Achievement is improving at a faster rate than average in the school. The head teacher provides excellent leadership. This is an independent Christian primary school (ages 3 - 11), established in 1979, catering for 73 pupils at the time of its last inspection, by the Independent Schools Inspectorate in 2010. The majority of its students are of Black African heritage, and its fees range from c£2,000 p.a. to c£5,100.Its 2010 inspection report concluded that "Pupils achieve satisfactorily, overall .. (the school's) key strength is knowledge of Christian beliefs and philosophy ... some lessons lack opportunities for independent thinking and learning, as at the time of the previous inspection." "Results in National Curriculum tests at the age of eleven over the last three years have been moderate overall in comparison with the national average for all maintained primary schools." As far as governors are concerned, the inspectors concluded;" There are shortcomings that render governance unsatisfactory." This independent day school opened in September 2011 and caters for pupils aged 3 - 11 years. At the time of its only Ofsted inspection (2012) there were 29 boys and 32 girls on the school roll, as full time pupils and a further 13 part time pupils. School fees are £3,030 p.a. The Ofsted inspectors concluded that "Alif Academy provides a satisfactory quality of education and is an improving school, which meets its aims. The school meets all of the regulatory requirements for independent schools ... Teaching and assessment are satisfactory. Provision is not better because teaching is inconsistent and pupils do not make consistently good progress." This independent primary school (5-11) was opened in September 2003 and at the time of its latest Ofsted inspection, 2009, catered for 79 boys and 37 girls. The annual school fees are £2,000. Ofsted inspectors assessed the school to be providing "a sound education for its pupils and is achieving its Islamic aims. The curriculum adopted is broad and fairly balanced." A "light touch" inspection of the academy in 2009 accepted the fact that the school addressed its Islamic aims, but was critical of the school's provision of creative and aesthetic experiences and felt it could improve its ICT provision and school improvement plans. This school was opened in 2004 in a former builder's yard. It currently has 48 pupils - 24 girls and 24 boys, though is able to recruit up to 80. All staff and teachers are practising Muslims. According to its latest inspection report (2012), the quality of education, teaching and assessment and the pupils' spiritual moral, social and cultural development are all satisfactory. Pupils' behaviour is good, and the school makes good provision for the pupils' welfare, health and safety. The quality of education in the school had not improved significantly from its previous inspection, in 2010. ﻿The school days starts with lengthy Islamic studies, which focus on the reading of the Qur'an and the teaching of Arabic. ICT provision at the school is dated. Teachers pay very good attention to ensuring equality in lessons, treating all pupils equally, regardless of gender or background. Annual fees for the school are £1,201. In what sounds like the opening line of a rather off-colour joke, there is a Jewish cemetery, predominantly Muslim cemetery, a public sector and a private sector cemetery all within Forest Gate. In June we published the first of a two part look at Forest Gate's local cemeteries, and their occupants, featuring the largest - The City of London Cemetery. In part 2 we look at the other, smaller, four of them. As we have previously indicated, Forest Gate became a growth area for cemeteries in the middle of the nineteenth century, as inner London burial grounds became overcrowded and couldn't cope with the metropolis' rapidly expanding population and when public health concerns lead the government, and others, to look to provide burial grounds away from heavily populated areas. Cheap, available land and recently developed good and fast rail links to inner London made Forest Gate an obvious location for the capital's dead. The array of what was built and later developed in our area is fascinating. This is the area's third oldest cemetery, having been established in 1857, the year after the City of London's inauguration (see June). 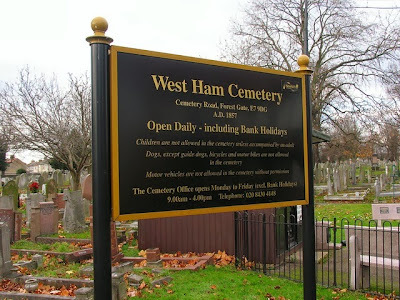 A West Ham Burial Board was established, as a result of the 1850's Burial Acts to secure a plot for a local publicly owned burial ground. It proved difficult for the Board to obtain enough land at a suitable price, but they eventually succeed in persuading Samuel Gurney, of the Quaker family - related to the Frys, to sell them 12 acres, in 1857. This was extended to 20 acres in 1871. There are three sections to the cemetery, covering consecrated, unconsecrated and Muslim areas. A small low brick wall separates this burial ground from the West Ham Jewish Cemetery- see below. • George and Catherine Bennett. 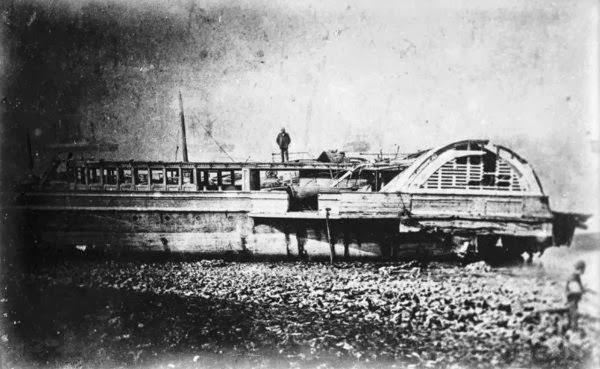 They were two of the 550 people who drowned when the pleasure steamer The Princess Alice sank, following a collision, on the Thames, in 1878. • Frederick Sells and Henry Vickers. They were two of the firemen killed in the Silvertown munitions factory explosion, which killed 69 people and injured 390 others in 1917. A procession a quarter of a mile long followed their hearses to their funerals. • Albert Wardale was drowned in the Egypt, which sank in 1922, with the loss of 96 lives and over £1,000,000 gold and silver bars. There are 214 war graves, from both World Wars, and various war memorials in the cemetery. This is a privately-owned cemetery, and unlike many other similar burial grounds, is well maintained by the owners/management company - which has run it since its original construction 140 years ago. It occupies 50 acres and was established in 1874. 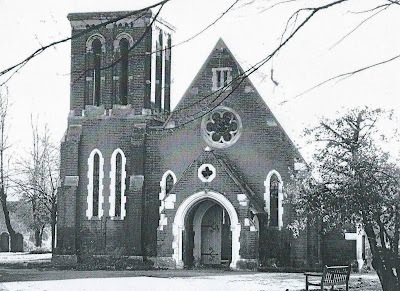 The chapel was built in 1877, but was hit by a bomb in 1944; so it was rebuilt in 1955, when a crematorium was added to its east side. It is very much a locals' cemetery. 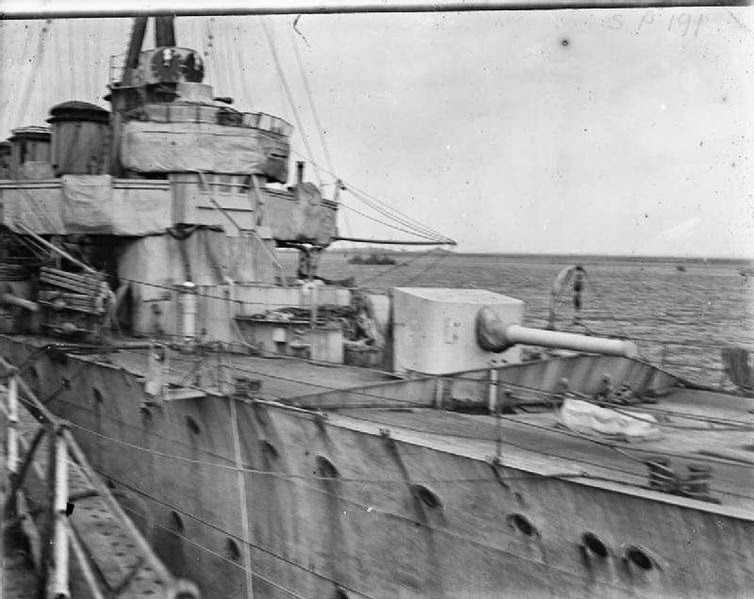 It counts a Victoria Cross holder, a royal nanny and a Ripper victim among its occupants. • John Travers (Jack)Cornwell (1900 - 1916). Manor Park resident Cornwell is the cemetery's most famous occupant. 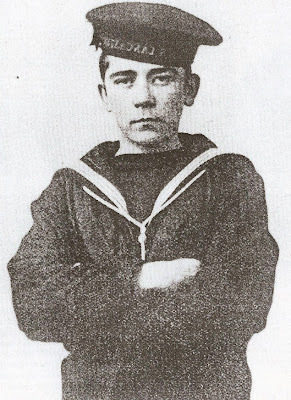 He is the country's third youngest Victoria Cross holder, which was awarded posthumously to him, for his bravery as a 16-year old at the Battle of Jutland. The epitaph on his headstone reads "It is not wealth or ancestry but honourable conduct and a noble disposition that maketh men great". 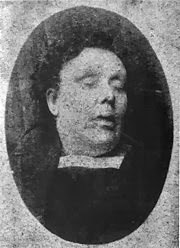 • Annie Chapman (1841 - 1888). 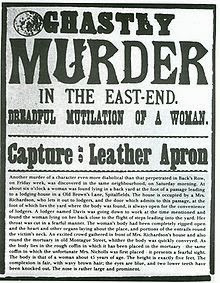 She was the second victim of Jack the Ripper. Although murdered in Whitechapel the police and her family wanted a private no-fuss funeral, so chose the Manor Park Cemetery, some distance from her residence, the scene of the crime and the mortuary in which she had been kept. She was buried in an unmarked public grave, the site of which, apparently, has subsequently been reused for another burial. • Mary Orchard (1830 - 1906). Orchard served as Princess Alice's (the person, not the ship!) children for forty years. 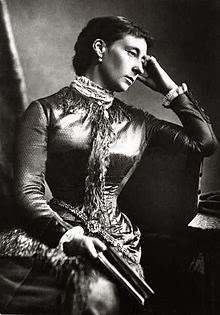 Princess Alice was Queen Victoria's third child, and an unlikely supporter of women's rights. Orchard's monument was erected "in grateful memory by Victoria, Princess Louis of Battenberg, Elizabeth, Grand Duchess Sergius of Russia, Ernest Louis, Grand Duke of Hesse and Alix, Empress of Russia". It is not recorded whether their devotion to Orchard stretched to attendance at her funeral. In contrast to Manor Park cemetery, this is a privately owned burial ground (owned by Badgehurst Ltd of Grays, Essex) which suffers much neglect and is in a sorry state. It is tucked away behind a Tesco convenience store and service station. It was founded in 1890 and covers 28 acres. It has certainly seen better days and is a mass of undergrowth, bordered on one side by the chimney pot railway line. It's gothic chapel, suffering from broken windows and in a general uncared-for appearance, was demolished in 2006. The burial ground is the only one in the country to have an Act of Parliament devoted to it - the Woodgrange Park Cemetery Act 1993, achieved by the exertions of the Friends of Woodgrange Park Cemetery (www.fowpc.co.uk). Their efforts were directed towards preventing Badgehurst from selling the land off for development; although largely successful, the Friends, however, have had to witness a section of the land being sold off for housing, with the 14,000 interred being moved elsewhere within the cemetery. It has subsequently, effectively, become a Muslim cemetery, but remains in an untidy and scruffy state of repair. There are a total of 287 World War 1 and 101 WW11 burials in the cemetery and an impressive war memorial, the details of which are meticulously detailed on the Friends excellent, though slightly dated, website. There are no exceptional tombs. Its most notorious occupants are the five Iranian terrorists who were shot during the siege of the Iranian embassy in 1980. They are buried in unmarked graves. 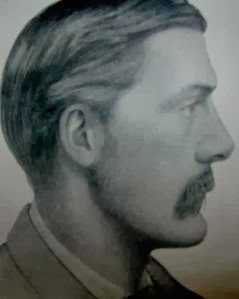 Its most distinguished internee is probably Frederick Charrington (1850 - 1936). Charrington was a member of the well known family of brewers but became known as 'The Great Temperance Advocate" for his vigorous promotion of abstinence. 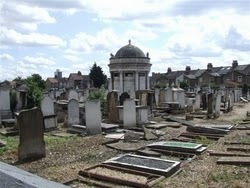 Although technically in Stratford, this cemetery adjoins, and has often been confused with, the West Ham cemetery, above. It was established in 1856, in the same year as Forest Gate's first cemetery - the City of London (see previous article). With the rapid decline of the local Jewish community, to which we will return at a later date, the cemetery has effectively been closed since 2002, although permission to visit can be obtained via the appropriate Jewish authorities. Over 40,000 people have been interred here, and it hosts the graves removed when the Hoxton cemetery was redeveloped, in 1960. The most prominent feature of the cemetery is the Rothschild's mausoleum, erected for Evelina Rothschild, who died in childbirth in 1866, by her husband Frederick. 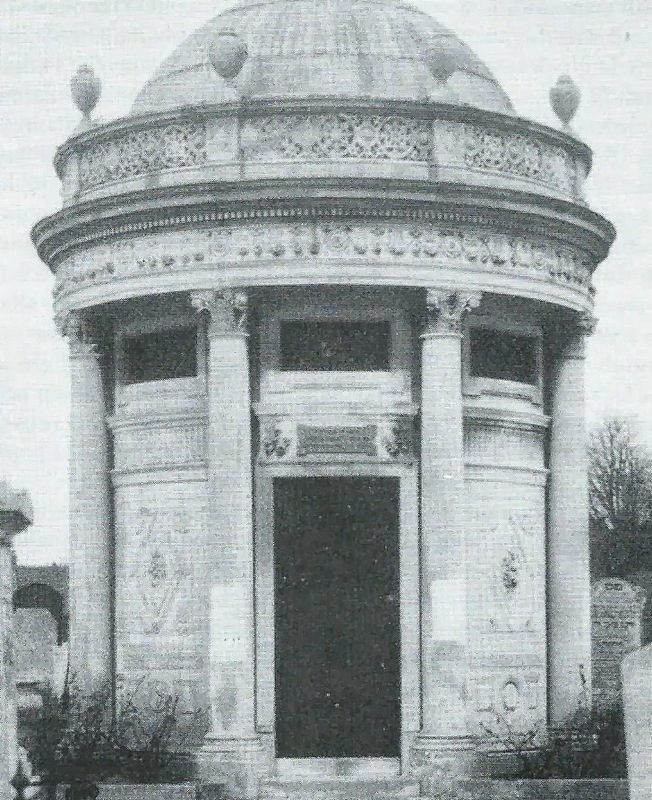 The pre-eminent architectural critic Nicolas Pevsner describes this building as a "noble and notable exception" to the otherwise undistinguished structures in the cemetery, which he explains is "a domed building on a circular plan with Baroquizing Renaissance details, by Sir Digby Wyatt. The deceased's initials are cleverly entwined." There are five Commonwealth War Graves located within the cemetery (four from the first and one from the second World War). In 2005 a number of monuments were destroyed and 87 graves were desecrated in what police described as an attack by anti-Semitic vandals. The doors of the mausoleum were ripped off by iron bars and swastikas were daubed on some tombstones and cemetery walls. With acknowledgements to London Cemeteries by Hugh Mellor, the Friends of Woodgrange Park Cemetery and Find A Grave for the information in this article. Over the coming months we'll feature the flyers and artistes appearing at the Woodgrange Road club, about which we've already provided a very brief history. So, after the summer holiday break in 1967, the club, which only lasted a year was back in business. 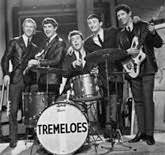 The Tremeloes came from Romford and by the time of the Upper Cut gig had parted company with Brian Poole, their former front man and ex-Dagenham butcher. Their Forest Gate gig came just months after their biggest hit, a one-time Four Seasons B side - Silence is Golden. The You Tube clip below gives a flavour of what the Upper Cut attendees may have heard. By mid September 1967 the Upper Cut club was featuring "Sweet Georgie Fame", at a gig on Saturday the 16th. Georgie Fame was born in Lancashire and later married into the aristocracy. He is currently a prominent member of the Countryside Alliance. He is still on the music circuit, playing solo and also accompanying the likes of van Morrison and Bill Wyman and the Rhythm Kings. Fame had a number of hits, solo and with his band, The Blue Flames, in the 60's, including the jazz-influenced Yeh, Yeh, Sunny and the Ballad of Bonnie and Clyde. His appearance in Forest Gate came months after his hit Getaway, which undoubtedly would have featured in Woodgrange Road 46 years ago. Not sure whether the song is a reference to Forest Gate, itself, or whether the train journey featured in the video, below is "Sweet Georgie" on his way from Forest Gate to Liverpool Street. The end of September saw a gig featuring Unit 4 + 2. The group toured between 1963 and 1970, when they were disbanded, never to play, together, again. Most of their members subsequently faded into musical obscurity. The band's appearance in Forest Gate came soon after their biggest hit, Concrete and Clay, featured in the You Tube clip, below. We will feature monthly updates of Upper Cut gigs (1966 - 67) over the coming months and eagle eyed readers will see that Forest Gate hosted Stevie Wonder in October 1967. The delights of which, and details to follow... ! !